Just so you know, I didn’t end up taking either of those trips — in part because I’ve done them in the past, and I wanted to go someplace that was new to me. (Although both are on the road trip bucket list for next year.) 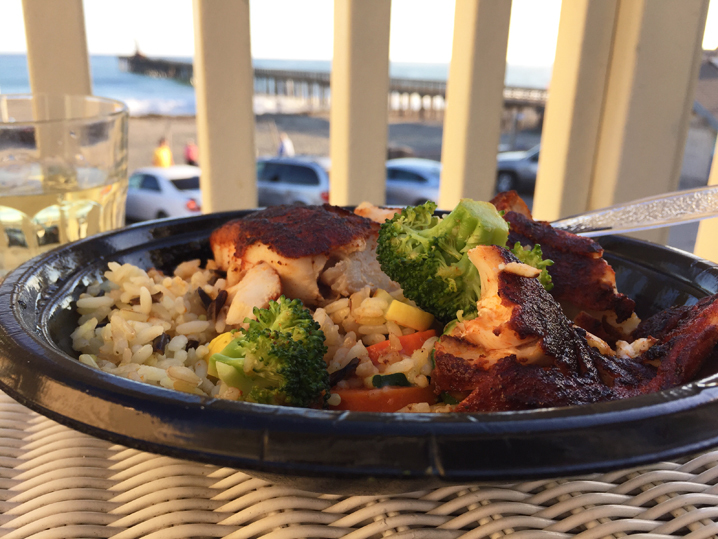 Instead, I decided to focus on visiting the Central Coast, which has been getting more press for its rising food and wine scene during the past few years. With five days all to myself and Little Cat’s petsitting needs taken care of, I made a plan head south down 101 right after the 4th of July. I’d land in San Luis Obispo for a few days, then head to the coast to finish up the trip before heading home via Highway 1. 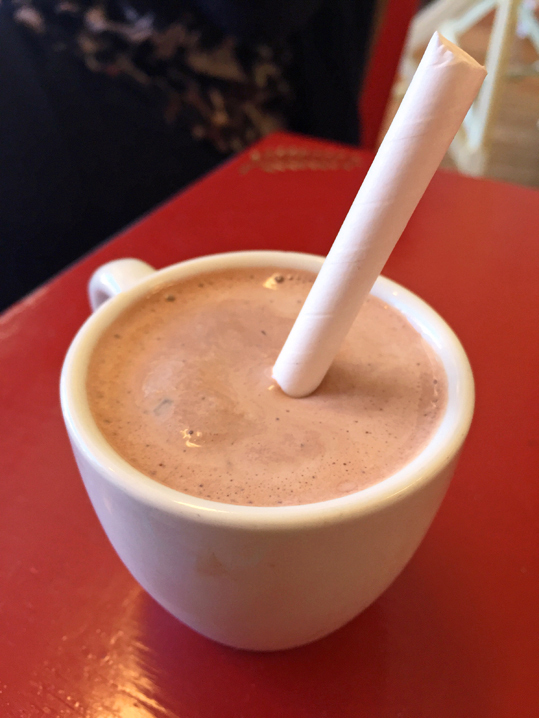 It was going to be my own personal food tour, with a bit of California history on the side. The beginning of my trip included short tours through Soledad and Salinas, two cities that are central to California’s agriculture industry. The Salinas Valley is an amazing sight in mid-summer — enough to make you want to pull over from the speedy raceway that is 101 South and just take it all in. Beautiful, bright green fields (despite the drought and daily temps in the high-90’s) full of workers, picking, pulling, and loading. Awe-inspiring, and yet quite humbling when you realize that you’re in the heart of “the Salad Bowl of the World,” an area that produces approximately 80% of the world’s salad greens. Even more so that so much of that hard work is still done manually, in 90-plus-degree temperatures. Heading out of Salinas, I was hankering for my first road food snack. It was a little too early in the trip to go right off the rails with heavy, greasy, processed fast food. (And who am I kidding? I don’t eat that way even on a bad day. My idea of comfort food is roasted vegetables and steamed broccoli.) Given my own dietary choices, it gave me the perfect opportunity to think about what’s out there for non-standard, non-meat-based diets. Erm, not much. You need to get creative (and bring your own snacks). Much as I’m a fan of local and family-owned over corporate food choices, Starbucks’ snack boxes came in for the win. 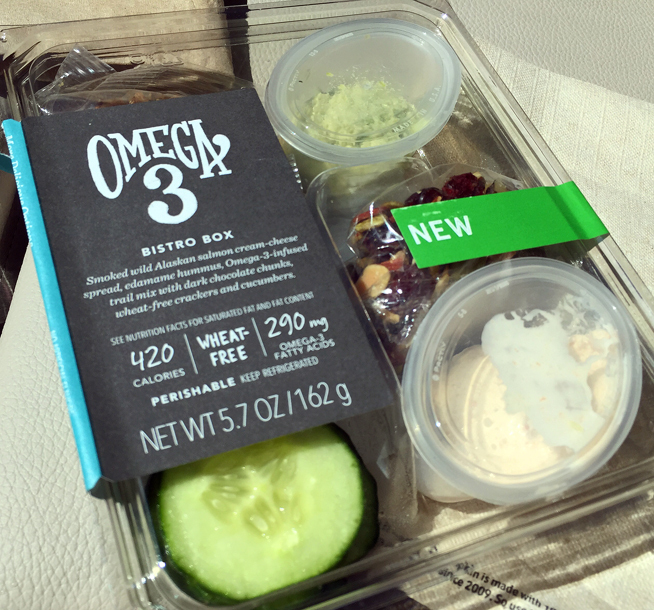 Passing by pizza joints and burger spots on my way out of Salinas I popped into Starbucks for a bottle of water and came across their new Omega-3 Bistro Box. While being on-trend, it’s also vegetarian and gluten-free (but not vegan). 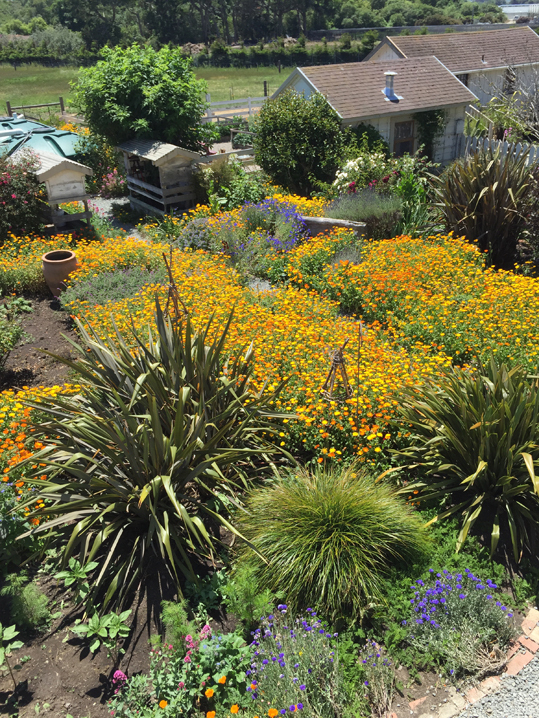 I arrived in San Luis Obispo just in time to get check in to my bed and breakfast before heading out to experience the Thursday Night Downtown San Luis Obispo Farmers’ Market. 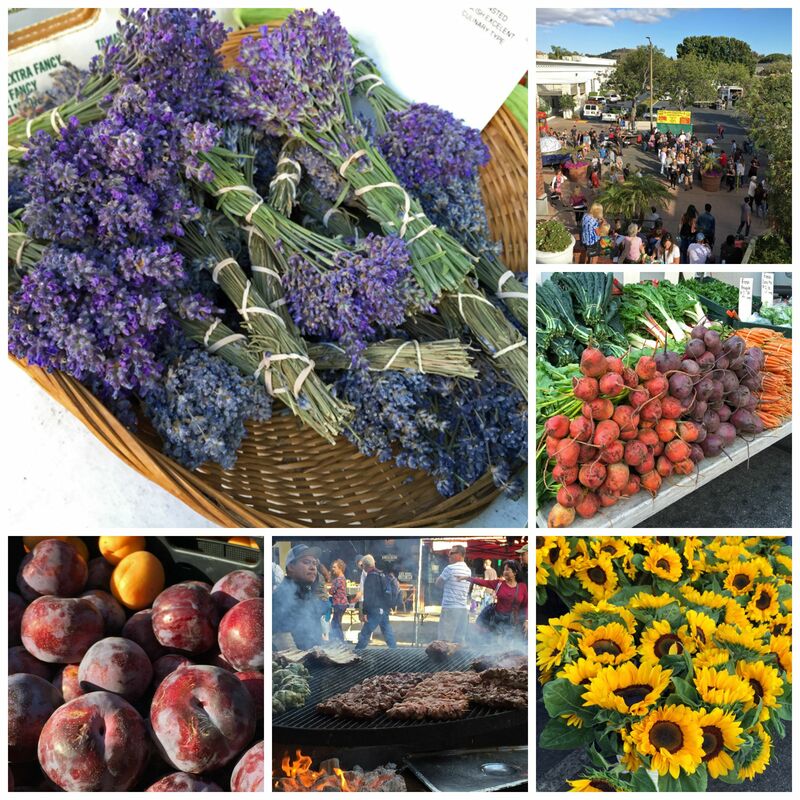 More than a market, it’s a family-friendly evening event with farm-fresh produce, local food stalls (including award-winning barbeque), handmade products, and a variety of entertainment. 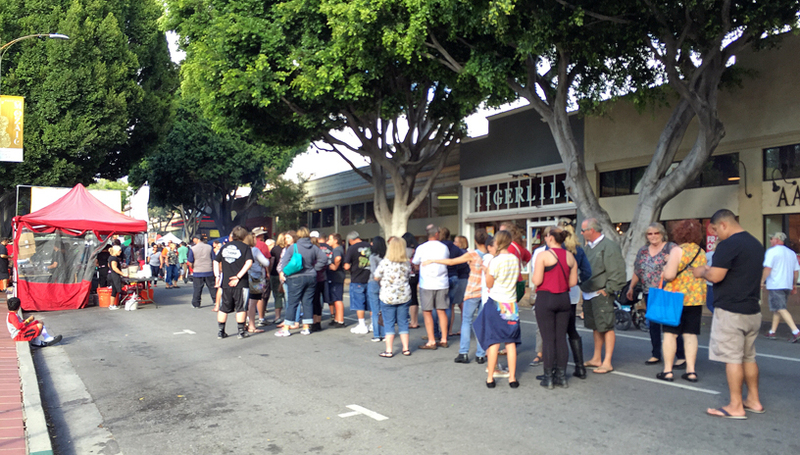 The market, which runs 6 – 9pm, covers five city blocks of Higuera Street, between Osos and Nipomo. Much of the produce I saw came from areas around SLO, and far south as Santa Barbara. While it was all beautiful, fresh, and local, I was surprised that there were so few organic vendors at this market. Another surprise? SLO is a meaty town — there’s a real love of barbeque here. That award-winning barbeque stall I mentioned? Locals were already lining up at 5:30, well before the market opened! That must be some GOOD barbeque! Downtown shops, restaurants, and bars along Higuera stay open during the market, which means that you can wander, shop, dine, and cocktail, as well. Or just hang out. The weather was just gorgeous — warm enough for summer clothing without a jacket — and the streets were full of happy people. I wandered, sampled, and chatted with vendors for about an hour, and then headed over to Luna Red to sample a craft cocktail or two and check out their small plate menu. Thursday night seems to be THE night to be at Luna Red, a tapas-style restaurant located just a block north of Higuera on Chorro Street. With perfect summer weather and almost two more hours of daylight coming, the outdoor seating area was packed when I arrived at 7pm. No tiny patio, Luna Red’s outdoor seating area could pass for a small restaurant all on its own. The variety of seating includes high-top and regular tables, a fire pit with “couches,” and outdoor bar. It’s casual and fun, with a relaxed vibe. 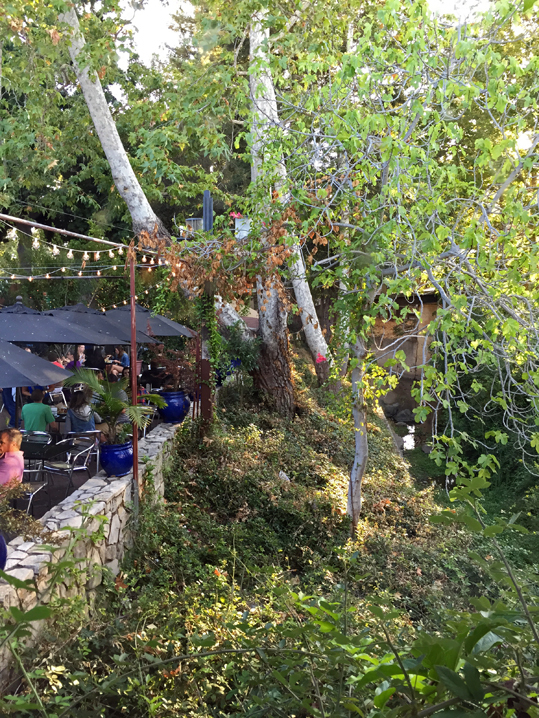 Inside, the restaurant pairs a contemporary design with a mission-style building that consists of a front room, long (red-lit) bar, and a back room with windows that look over the nearby creek. The interior of the restaurant is quieter, but also darker. My server, Thomas, was friendly and knowledgeable, answering all of my questions about the cocktail and food menus. The craft cocktail staples, whiskey and gin, figure heavily into the cocktail menu, but there’s a little sumpin’ sumpin’ for every palate. You know I’m a tequila and mezcal kinda girl, so the Smoke and Mirrors (mezcal, benedictine, dry vermouth, grapefruit bitters, rosemary, lemon twist) was just what I needed. The bar gets creative with non-alcoholic drinks, as well, with options like Blackberry Stonefruit (blackberries, stonefruit shrub, lemon juice, soda) and Fig and Thyme (thyme, fig shrub, lime, soda). The food menu is what I’d call globally inspired, but with a Latin-fusion focus. The restaurant emphasizes supporting local food producers, as well as sustainable farming and fishing techniques. (Note: Dishes reflect the season, so keep that in mind if you visit during the non-summer months. Some of the dishes I’ve mentioned here might not be available.) 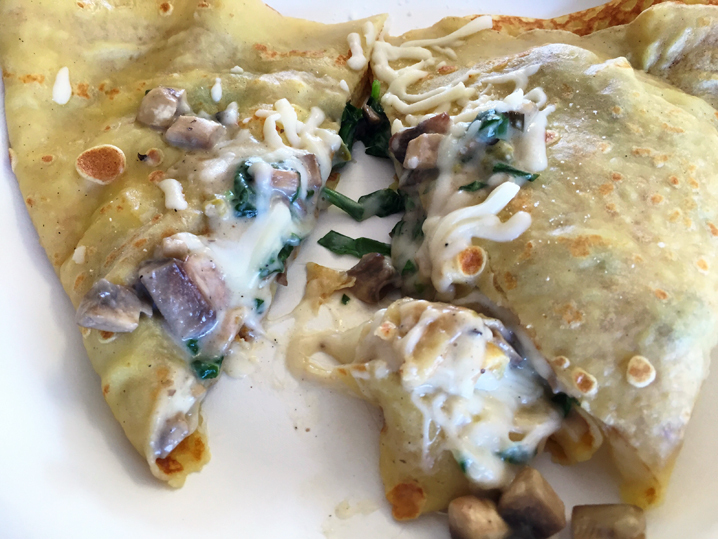 Luna Red is also very conscious of alternative diets; every dish on the menu has a small abbreviation next to it that indicates whether it’s gluten-free (gf), dairy-free (df), vegan (v), or contains nuts (n). With five categories — Raw, Small Plates, Paellas, Flatbreads, and Sweets — you’re bound to find a dish or two that calls to you, and everything is meant to be shared. (And GF and DF folks, rejoice! There are approximately a dozen menu items that will suit your diet.) Paellas are the largest dishes and definitely meant to be shared. Even in the Paella category, gluten-free, dairy-free, and vegan folks get a vote. Three of the four paellas are GF/DF, and the fourth is vegan. If you’re choosing amongst Small Plates (the largest menu category), the restaurant suggests 2 – 3 dishes per person and 3 – 5 dishes per couple. The four-top across from me ordered a half dozen dishes to share. Some examples of Luna Red’s small plates: Goat & Berries salad (summer berries, red quinoa tabbouleh, grilled stonefruit, honeyed chevre), Gambas Al Ajillo (sustainable shrimp, paprika olive oil, garlic confit, chili flake, citrus bread), and Pork Short Ribs (honey-chimichurri, garlic green beans). I was eying the Gambas and a salad, but here’s where my dietary choices went off the rails a bit. 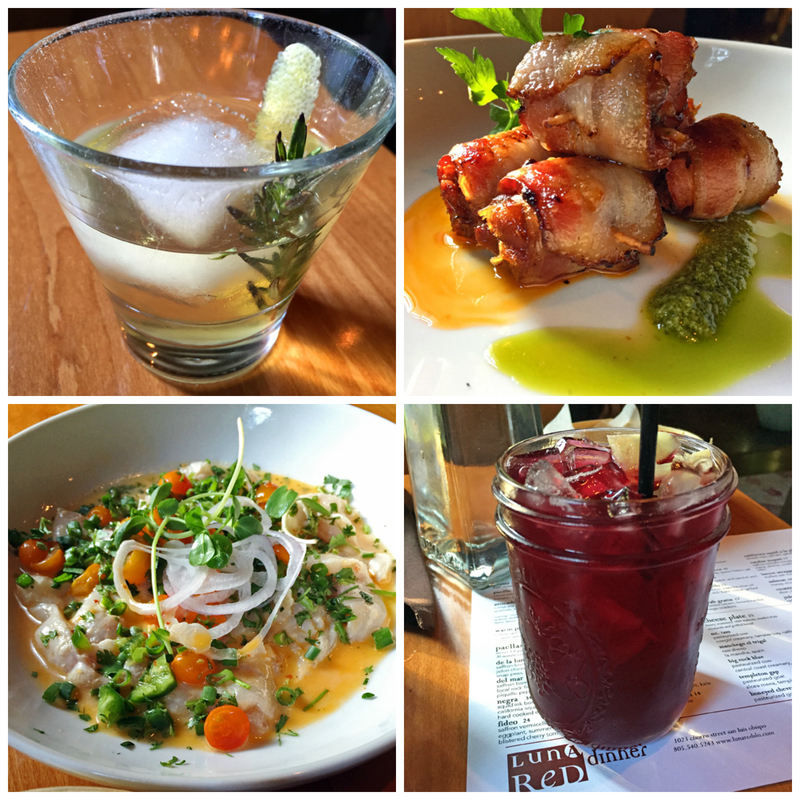 I opted for the Pacific Rockfish Ceviche (citrus juice, honey, cilantro, jalapeno) from the Raw section, and while I don’t usually eat meat, the Bacon-Wrapped Dates (stuffed with House-Made Chorizo) were calling to me from the Small Plate section. (Hey, it was a road trip, after all! Why not try something new?) The ceviche was perfect for a warm summer evening: fresh, tangy, and delish. The dates were a bit heavy for the warm weather (for me), although they were a nice balance of sweet, salty, and rich. 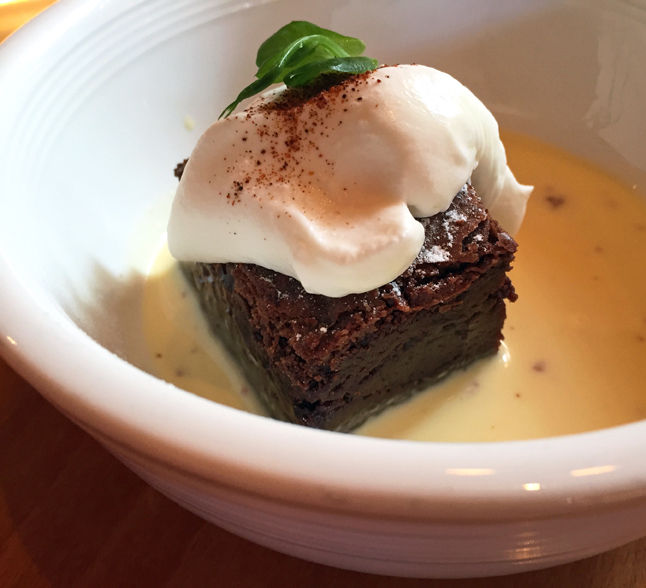 Still, I enjoyed every bite and decided that dish was a stand-in for dessert. A satisfying first day of my road trip completed, I headed back to my bed and breakfast for a good night’s sleep so that I would be ready for a full-on food tour of SLO on Day Two. The tiny town of Pescadero (pop. 643, as of 2010) in southern San Mateo county is probably best known for Duarte’s Tavern, a long-standing institution established in 1894 and lauded in Sunset Magazine for its now-famous artichoke soup. But there’s so much more to experience in Pescadero, as I learned this past summer. 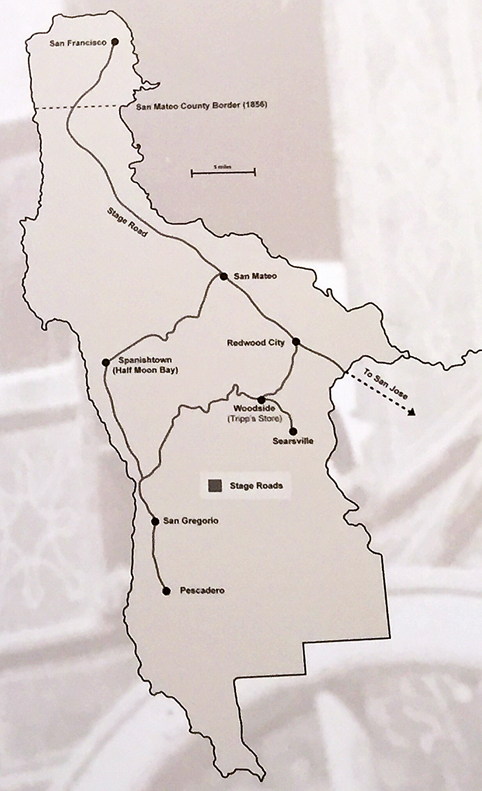 Historically important in San Mateo county’s development, Pescadero was part of the original stage-coach road system, taking travelers south from San Francisco to the coast. 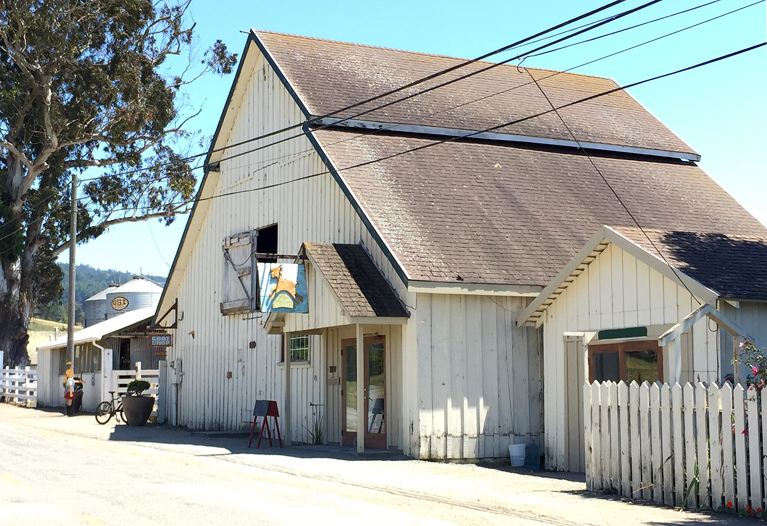 Equally important for the 650 is that Pescadero has been a fertile area for farming and ranching in San Mateo county since the 1860’s. Today we’re lucky to have sustainably raised food from Fifth Crow Farm, Root Down Farm, Pie Ranch, and Harley Farms Goat Dairy, to name a few. 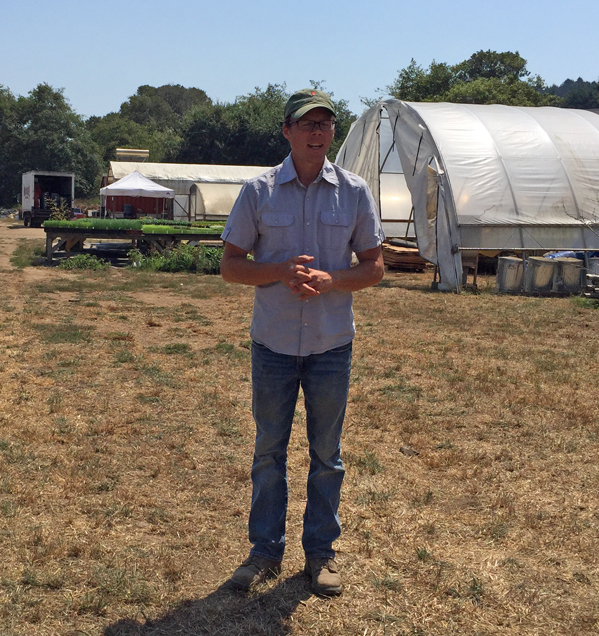 Some of these farms are supplying San Mateo county’s best restaurants, while also selling their products directly to consumers through farmers’ markets, farm stands, and CSA programs. When the Bay Area’s first round of super-hot weather descended in early June, I took that as a sign to head down the coast. A trip down Highway 1 is often a crapshoot. Microclimates being what they are here, a 30-minute drive across Highway 92 and over to the coast can take you from a siesta-inducing, 95 degrees on the mid-peninsula to a better-bundle-up, foggy 63 degrees on the coast. You just don’t know for sure until you get there (and it’s all part of the adventure, so bring extra clothes)! Fortunately, the day I headed south for a Food Day in Pescadero (the first of two), I lucked out with comfortable 70-something-degree temperatures that were enough to burn off the fog and expose the rugged beauty of the San Mateo county coast. My destination? Harley Farms Goat Dairy in Pescadero. Harley Farms Goat Dairy is a restored 1910 property located just about a mile west (inland) from Downtown Pescadero, right before the intersection of North Street and Pescadero Creek Road. The scenic route takes you through Downtown Pescadero, a cute don’t-blink-or-you’ll-miss-it town with a surprising array of places to indulge in food and beverages. Stop and explore, if you have time. 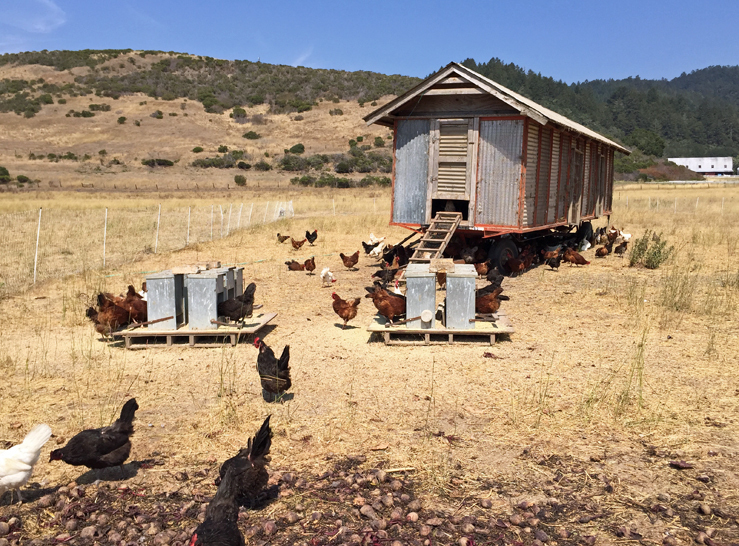 If you decide to bypass downtown and keep going west on Pescadero Creek Road, just know that the only entrance to the farm is on North Road (you’ll be able to see the back of the property), so you’ll have to take a sharp left there and backtrack a bit. Keep an eye out for the cream-colored buildings and goat sign hanging outside the shop. Park along the road, near the shop, or look for the Parking sign just past the metal tanks (near the large eucalyptus tree). The scenic nine-acre farm is primarily a working dairy that houses 200 alpine goats for milk and cheese production. The property also includes a barn, orchard, colorful garden, and shop where visitors can taste and purchase the farm’s products. The enchanting hayloft above the shop is the site of farm dinners and parties and offers a stunning view of the property and surrounding hills. 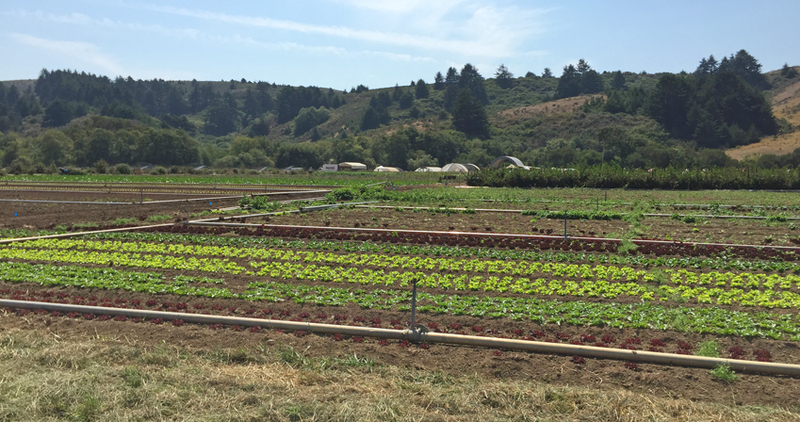 The farm is open year-round for private and public tours, retreats, and events. Guided tours, which must be booked in advance, take visitors around the property to view the farm in action, visit with the goats, and learn about the cheese-making process. The farm offers public tours on weekends, and you can easily book through the website. 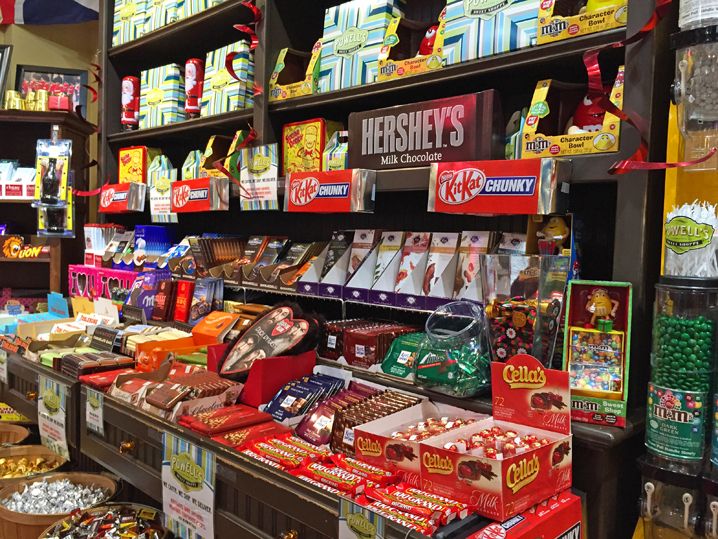 There are options for family tours (with kids) or adults-only tours (no kids). A word of advice: book early because tours and events book up quickly, especially May-October. Harley Farms will also work with you to create your own private tour or event. Corporate retreat? Birthday dinner in the hayloft? 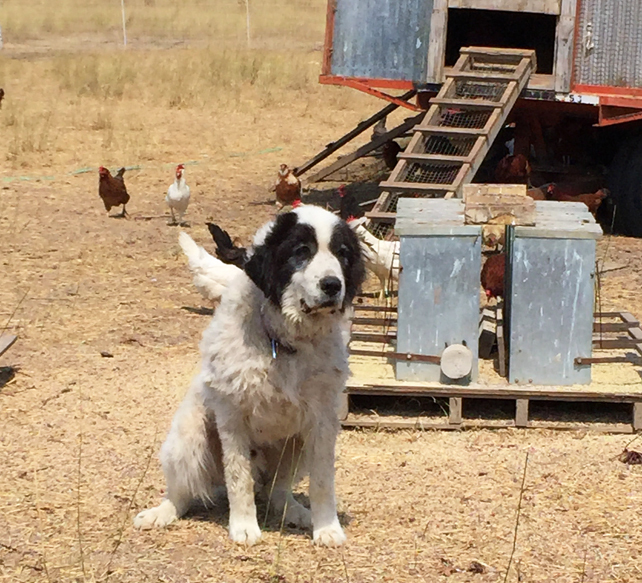 A farm tour with your extended family? Contact the farm directly for more information and availability. 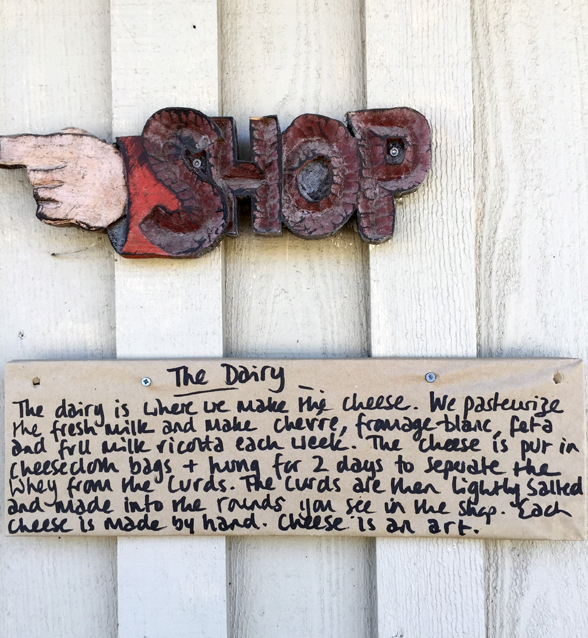 Even if you roll up without a tour booking (as I did on a random weekday), you can still enjoy the public spaces, view the gardens, watch the goats in their pens, and taste the farm’s award-winning products in the Cheese Shop. The farm produces feta, ricotta, fromage blanc, and of course, chèvre. 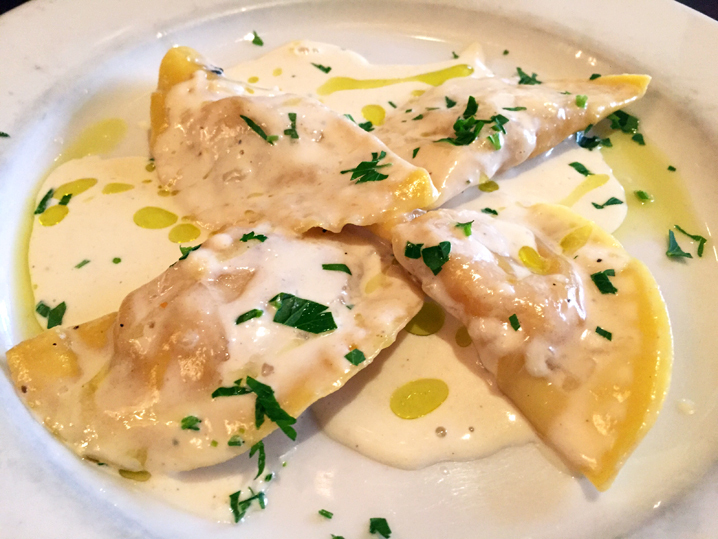 The fromage blanc, which has the texture of a soft, light cream cheese, is available plain or with flavor accents such as garlic and herb or tomato and basil. Pro tip: the tomato-basil fromage blanc pairs perfectly with the freshly baked artichoke bread from Arcangeli’s Market in town. Harley Farms chèvre is a classic goat cheese with a firm, but creamy consistency. It crumbles when chilled and spreads like cream cheese at room temperature. 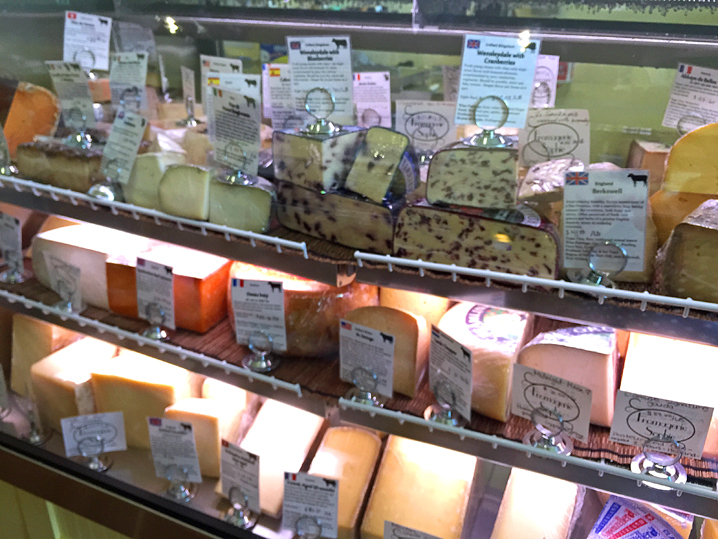 The Cheese Shop offers several sizes of chèvre, from cute “buttons,” perfect for tasting, to must-share rounds and logs. 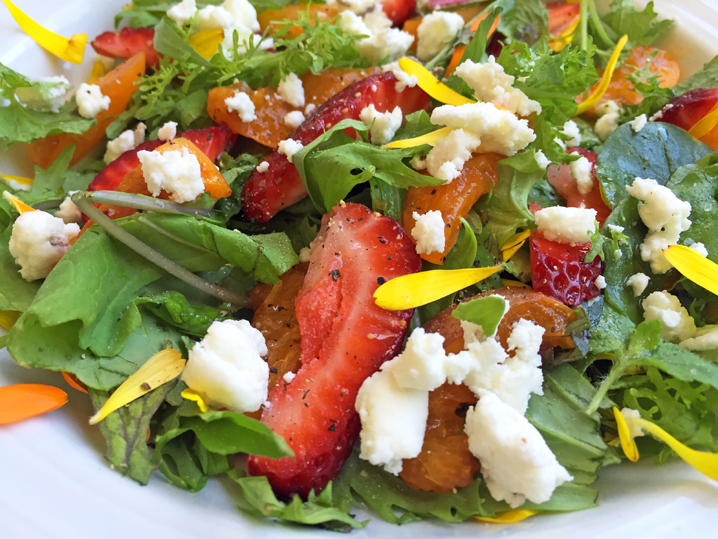 Flavor-wise, you can choose plain chèvre or dressed-up options topped with chopped apricots and pistachios; cranberries and walnuts; or pretty, edible flowers from Harley Farms gardens (aka, the award-winning Monet Cheese). I tried them all, but my hands-down favorite, however, is the Honey Lavender Chèvre. The sweet-herbal combination is well-balanced and complements the earthy goat cheese flavor. 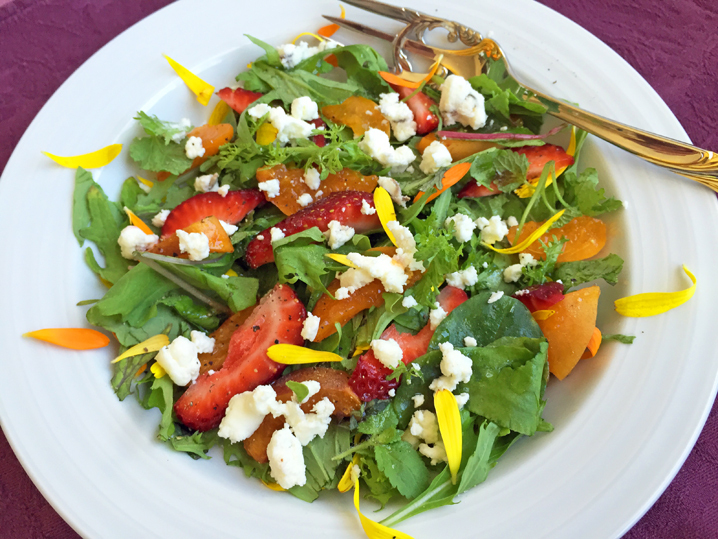 While it’s delish on a cracker, I found that the complex flavor combo is a perfect addition to a pretty summer salad of fruits, greens, and edible flowers. It was so good, I had to make a second trip to Harley Farms later in the summer for more Honey Lavender Chèvre. 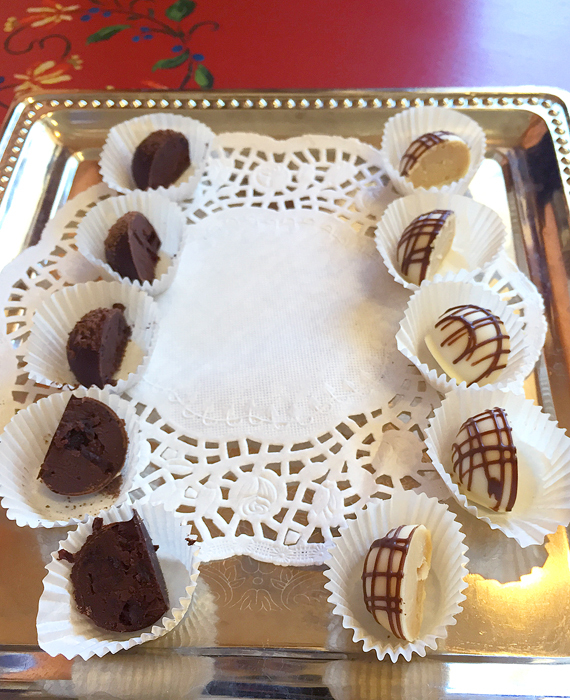 The shop also sells assorted sweet treats (handmade truffles and goat-cheese cheesecakes), bath and body products, and gifts. 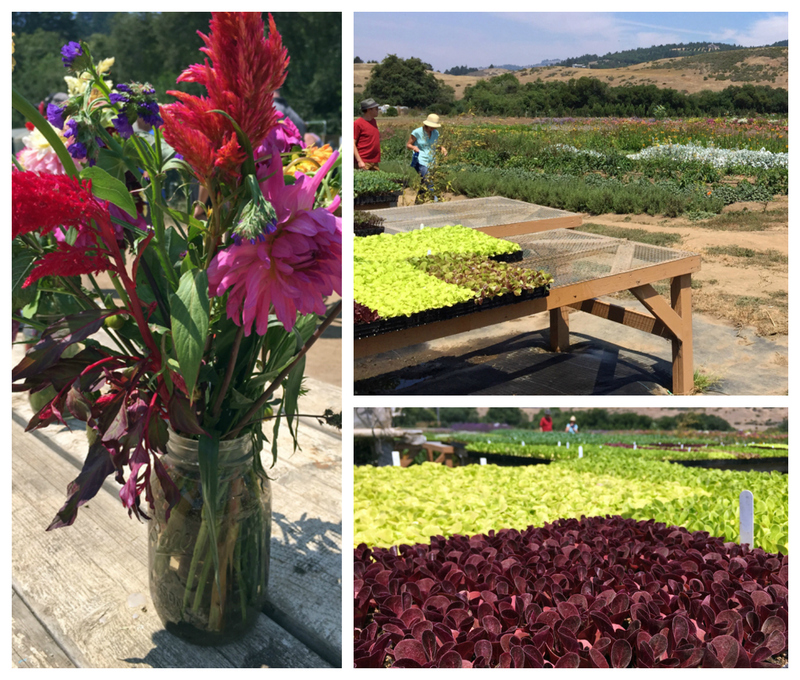 A small and vibrant part of the San Mateo farming community, Harley Farms is a worth a visit. 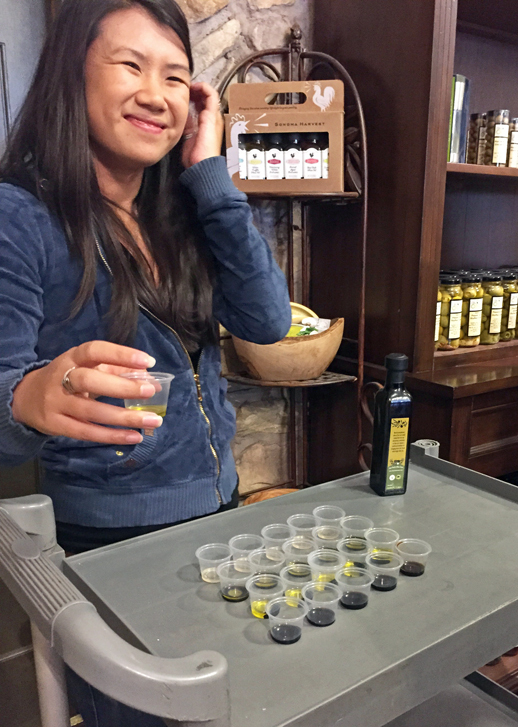 Book yourself a tour, bring along some picnic supplies (or stop into Arcangeli’s Market for that artichoke bread), and make a day of it. 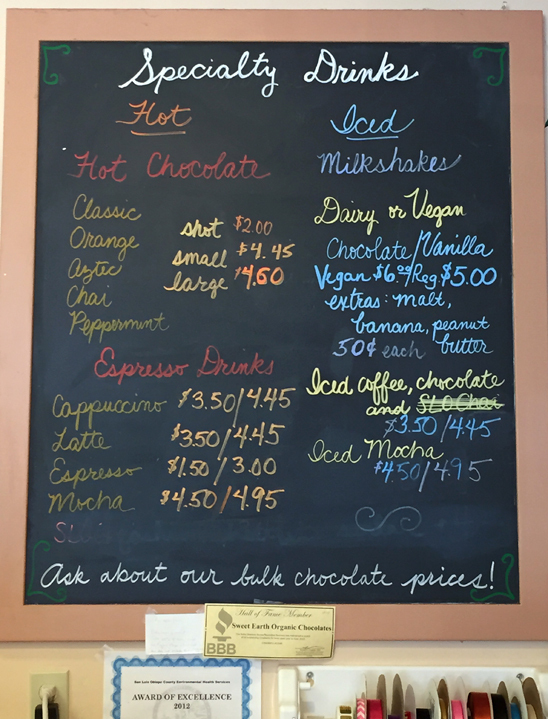 Have you visited Harley Farms Goat Dairy? Or a goat dairy in your local food system? Share your experiences in the comments below. As a solopreneur and long-time Boss of Me, I’ve been notoriously bad at taking time off, regrouping, and recharging. For years “time off” has really meant working double-time before or after, just to make up for the time off. So, if you do the math on that, there’s no actual time off. And the guilt — oh, the guilt! It’s a Greek chorus of “You should be…” following me everywhere I go. Yeah. Over time, that sort of thing takes its toll on your health and your creativity. Especially here in the Bay Area, we’re so worked up about, er, work, and being busy that we don’t make time to take vacations, see friends, or even sit down to a slow, comfortable dinner at home. It occurred to me that all of our “busy” and “not enough time” is self-inflicted. (And I’m not pointing fingers here. I’m the first to ‘fess up that my overworking and overscheduling is down to me and no one else.) It’s the choices we make about how we spend our time, coupled with a sense of obligation that leads to this feeling of being overwhelmed. I’ve been there enough times to know. And I’ve seen it affect the physical and mental health of friends and family — more and more as the years go by. I don’t think this is the way we’re meant to live. Taking a break allows you to breathe, get perspective, and hopefully regain the experience of enjoying your days, not rushing through them. My “what I did this summer” story isn’t some epic Eat, Pray, Love experience; I didn’t eat my way through a Grand Tour of Europe or run off to a yoga retreat in Costa Rica. In fact, most of my exploring happened close to home, and the farthest I ventured out of the 650 was to my parents’ place in rural Ohio. 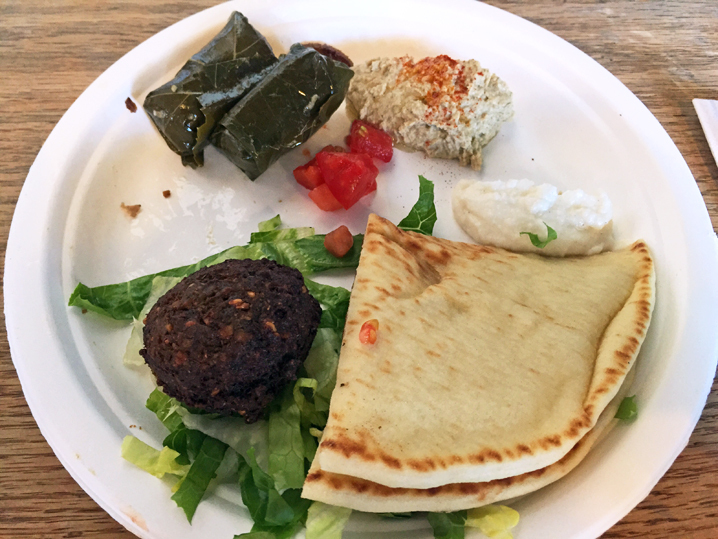 Mostly, I sought to savor every day — whether that meant researching a food-related topic for an article or blog post, spending time catching up with friends, or finally visiting local landmarks (Filoli Mansion & Gardens: check!). Of course, local food played a big part in how I spent my summer off. Following are some of the highlights of my summer; I’ll be writing about some of these experiences as part of #TBT in the coming weeks. Jam making is one of those sweet-kitchen skills that wasn’t covered in my culinary school program. It’s something I’ve wanted to learn for years, but was afraid to try for fear of (1) screwing it up and (2) botulizing myself or someone else. 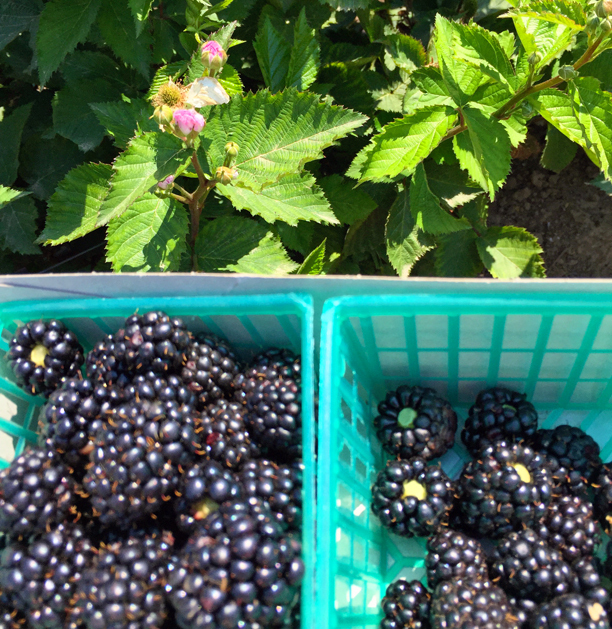 This summer I dug in, did my research, and turned about 50 pounds of fruit (booyah!) into jam. Really good jam. Guess what everyone is getting for Christmas this year? 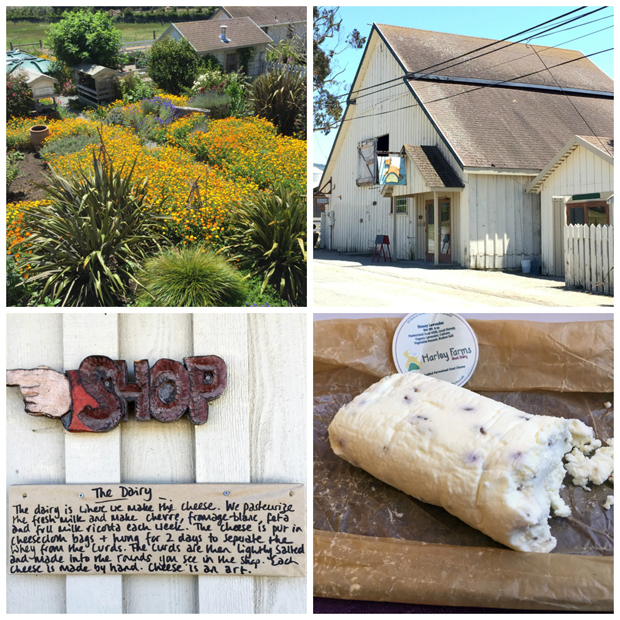 Early in the summer I took a day trip down the coast to Pescadero to check out their local food scene. 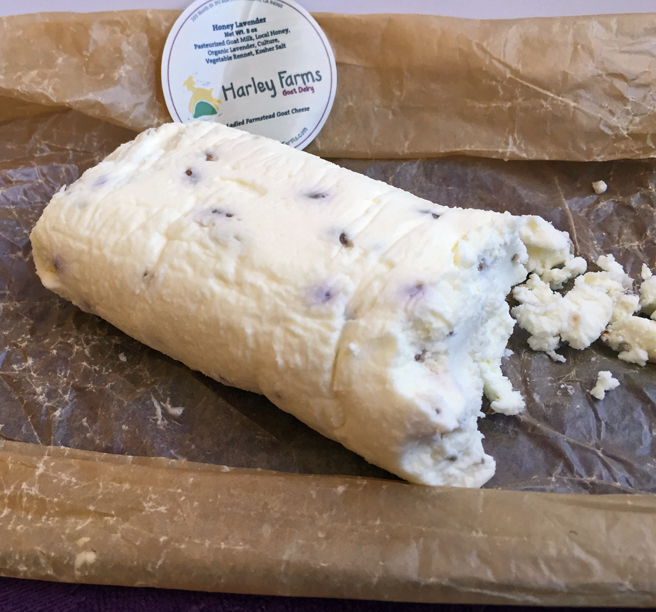 The folks at Harley Farms Goat Dairy make some delicious, award-winning goat-milk cheese: ricotta, fromage blanc, and (my favorite) chevre with honey and lavender. Located just past downtown Pescadero, it’s worth a visit. The gardens are beautiful, and the goats are adorable. 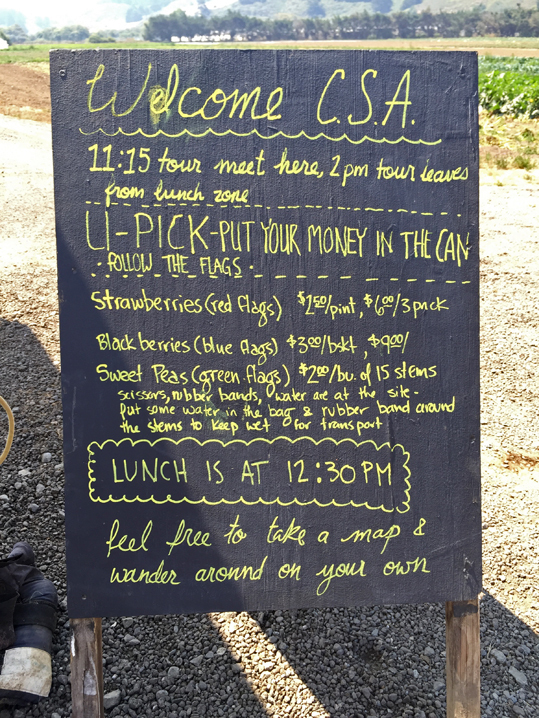 You can buy the farm’s products on site and picnic nearby. 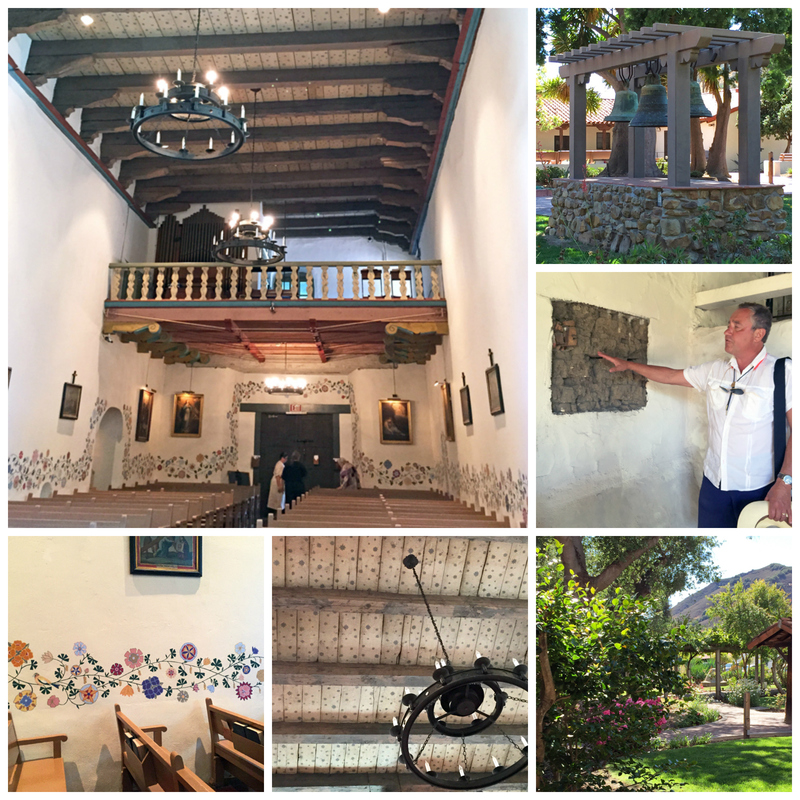 When I initially started thinking about a California road trip, I was focused on visiting historical sites — Hearst Castle, the missions, and so on. And yet, somehow my Central Coast trip became all about the food. 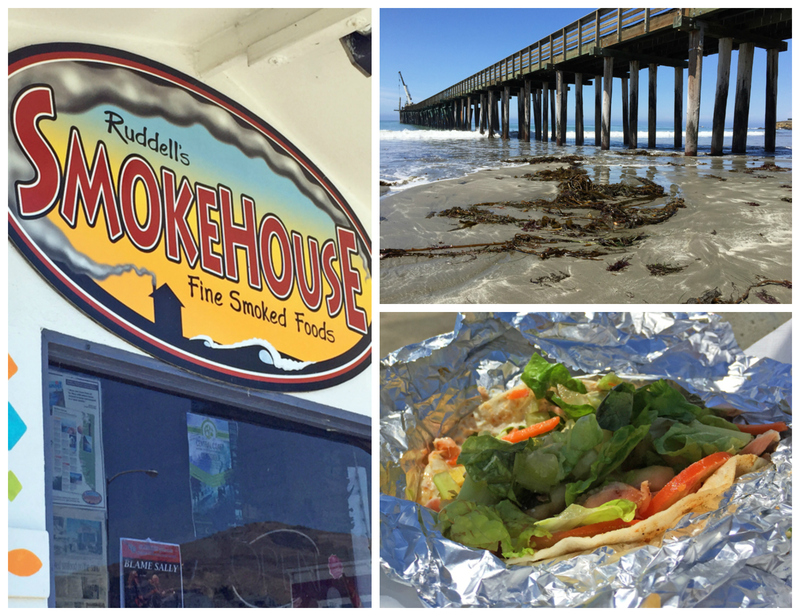 From the Thursday night Downtown SLO Farmers’ Market to Ruddell’s Smoked Salmon Tacos in Cayucos, I pretty much ate my way through San Luis Obispo county. 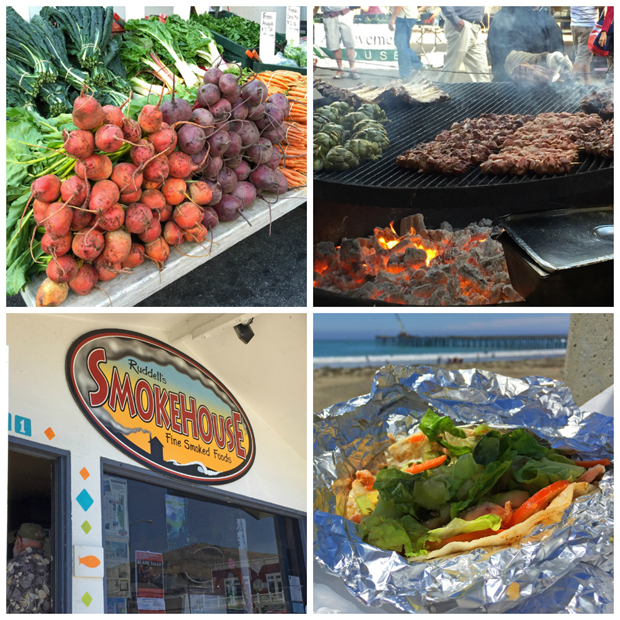 From the coast to San Luis Obispo, SLO county has some delicious eats! 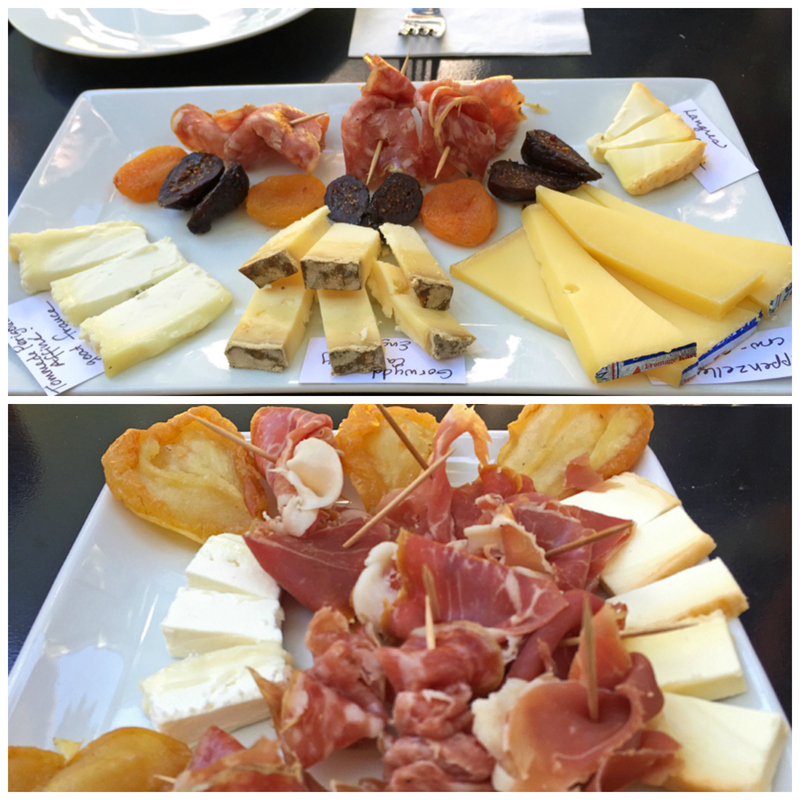 There’s something really indulgent about a leisurely weekday lunch, especially if there’s wine involved. 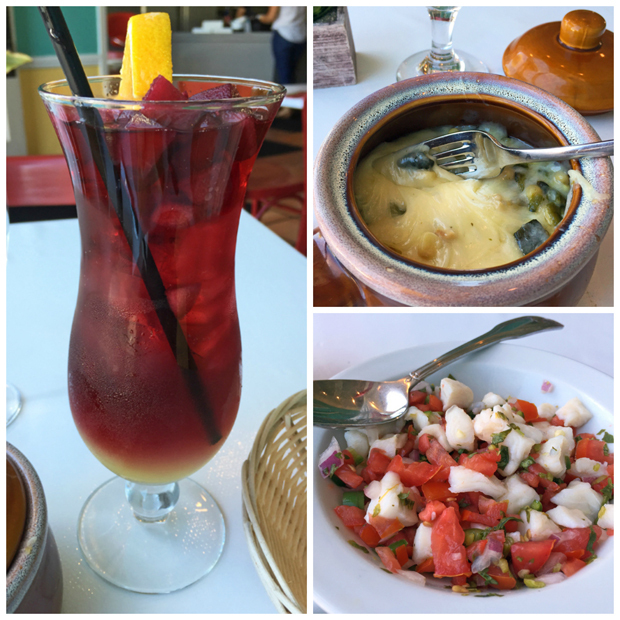 With its fresh, made-to-order food, sangria, and friendly service, Mama Coco Cucina Mexicana in Menlo Park became one of my go-to spots. If you’ve been following the blog for the past (eep!) almost two years, you know that I’m a strong advocate of knowing the source of your food. Know what you’re buying, where it was grown — and better yet, meet the person who made that food. 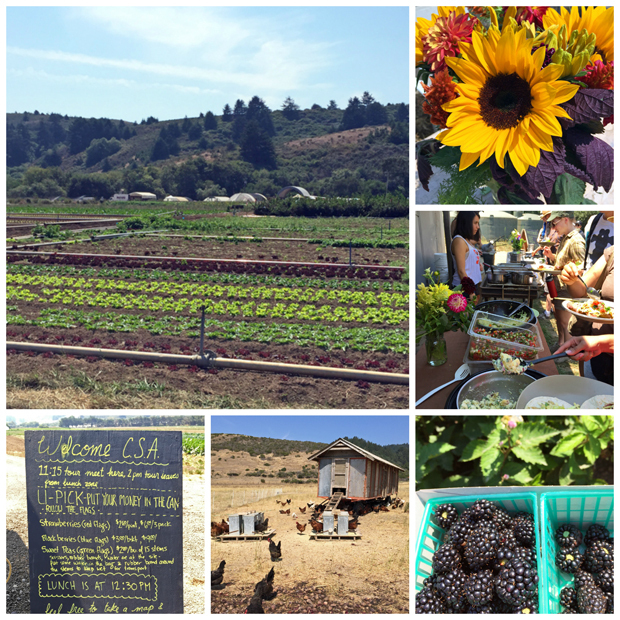 This past spring I switched my CSA from a larger organization, to the 650’s own Fifth Crow Farm in Pescadero. What better way to support the local food system and a growing small business? 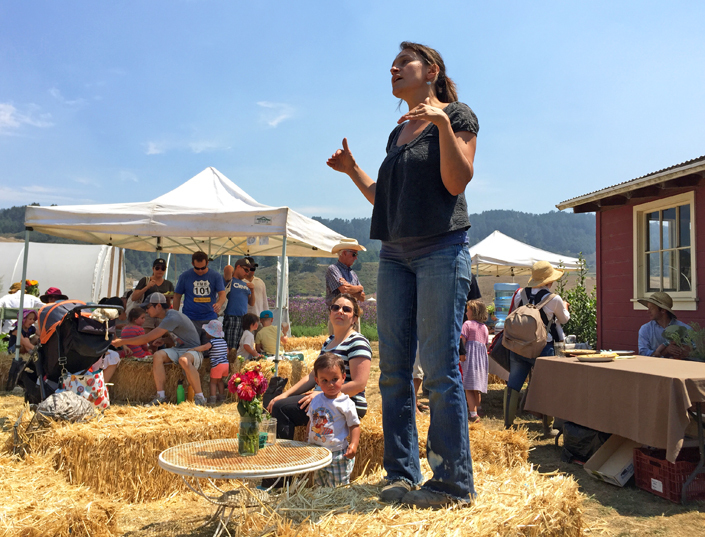 When the Fifth Crow folks announced the CSA-subscriber open house, lunch, and farm tour in August, there was no way I was missing it. That’s my summer summary. What about you? Share your “what I did this summer” stories and food memories in the comments below. Ever feel like you’re in a race to keep ahead of food waste at home — particularly during the summer? Summer, for all of its wonderful bounty of fresh produce from CSA boxes, farmers’ markets, and home gardens, also presents a challenge: how to make the most of the fruits and vegetables that come into your home before they get too soft, wilty, or (ugh) moldy? With the drought continuing here in California, it seems more important than ever to use up what comes into the kitchen, rather than letting it any of it go to waste. I seem to be managing the vegetables so far (salads — lots of salads with an array of lettuces — paired with roasted vegetables like fennel and carrots), but the fruit is another story. Between glossy, large, bright-red strawberries from Fifth Crow Farms and an abundance of quickly ripening backyard apricots and long-lingering lemons, I’ve got more than my fair share of fruit — and with it a small case of FOMO. I mean…What if I don’t make the most of that fresh, seasonal fruit while I can? If you’re struggling with the idea of not enjoying all of that fruit while it’s fresh, ease up. The beauty of eating seasonally is that you get to look forward to that bounty and really appreciate it while the food is available — when it’s at the peak of flavor and freshness. But you also have the option to preserve that fruit for later enjoyment, too. So, here’s your cheat sheet for enjoying summer fruit now and later. From proper storage to freezing to (yes, you can!) 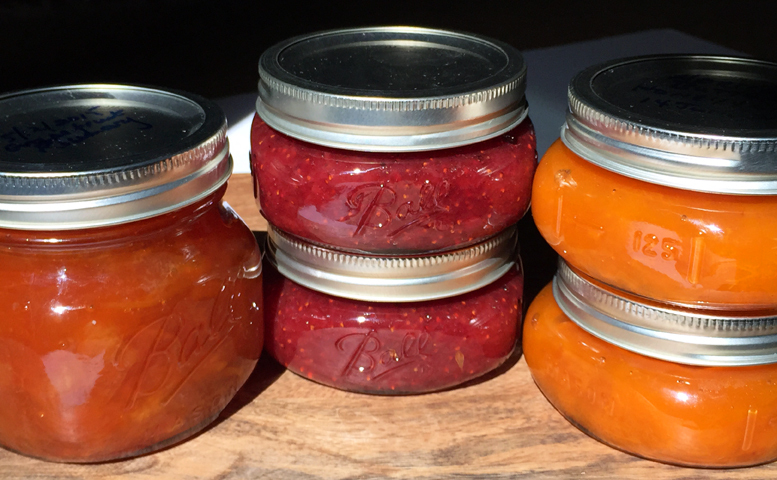 making jams and preserves, here are some ways to reduce summer fruit waste at home. I try to get as much life out of my fruit as possible, which starts with storing it appropriately. First thing to know: different summer fruits have different storage needs. More important is that not every piece of fruit has to (or should be) stored in the refrigerator. After many years of trial and error, here’s how I’m storing summer fruit. Berries: Don’t wash until you’re ready to use them. To store, line a plastic or glass storage container with paper towel. Arrange the berries in a single layer on the paper towel, cover with a well-fitting lid, and store on the top shelf of the refrigerator. Soft berries (raspberries, blackberries, etc.) will last a few days at most. I’ve been able to keep strawberries and blueberries this way for up to 10 days, but typically have to replace the paper towel and wipe down the interior of the storage container to remove condensation every 3-4 days. Citrus: Wash, dry, and store at room temperature in a dish or bowl if you’re going to use them within 2 days. Otherwise, store in a ziplock bag (with the air pressed out) in coldest part of the refrigerator (usually the bottom shelf or crisper drawer). I’ve kept citrus this way for up to three months. Wash the fruit, removing any dirt. Place on paper towels or cotton kitchen towels and pat dry, removing as much moisture as possible. Strawberries: Remove green tops and hull. Stone fruit: Slice in half and remove the pit. Blueberries and soft berries: Remove any stems. Arrange the fruit in a single layer on a parchment paper-lined sheet pan (don’t crowd or pieces might stick together when frozen), then place in the freezer for an hour or so — just until the fruit is frozen. 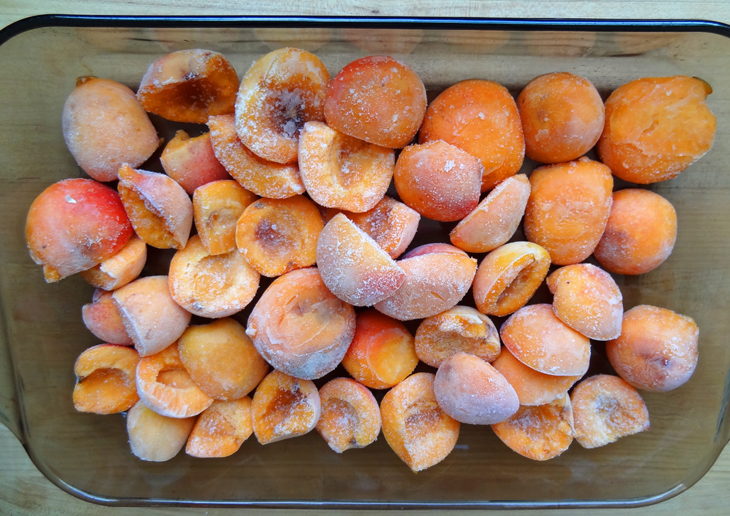 Frozen apricots: washed, halved, pitted. Ready for bagging. Store fruit in a freezer bag with the air pressed out. For more information about freezing fruit using the syrup and sugar pack methods, check out The National Center for Home Food Preservation’s web site. Compotes are my favorite way to use up berries that are past their prime for eating out of hand or not pretty enough for decorating a cake or tart. Berries, sugar, and lemon juice are all you need to make a quick berry compote, and you can tailor the amount of sugar and lemon juice to your taste. Need a starting point? For every 6 ounces of berries, add 1 to 1½ ounces of sugar and a teaspoon of lemon juice. Cook in a saucepan over medium to medium-high heat for 10 minutes for a thinner, saucy compote, or as long as 15 minutes for a thicker, jammy compote. 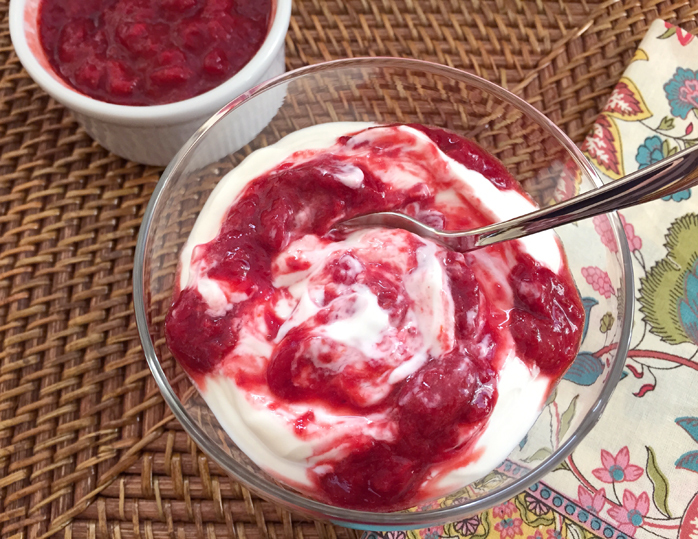 Try this Strawberry-Orange Compote (or substitute your favorite berries). I’ve been baby stepping my way into canning this year, but it’s turning out to be my new addiction! When I made my first batch of marmalade, and the canning seals didn’t bounce back when I tested them, I did the happy dance around my kitchen. 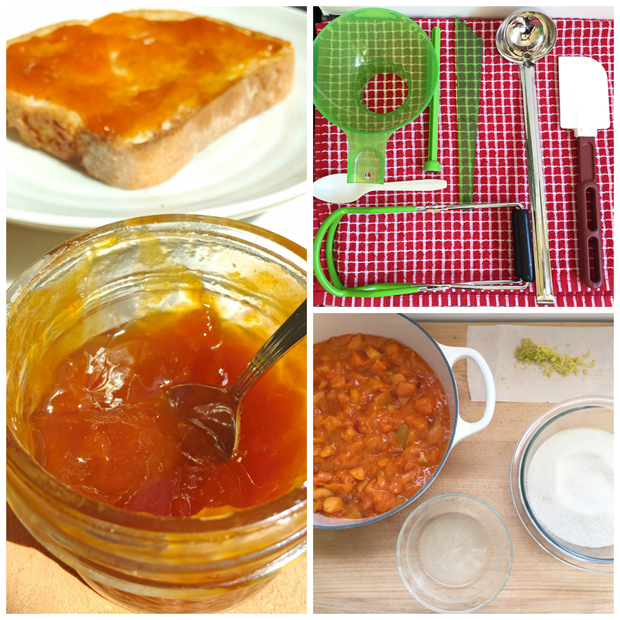 After another successful batch of marmalade, I was ready to move on to making apricot butter, and then strawberry jam. 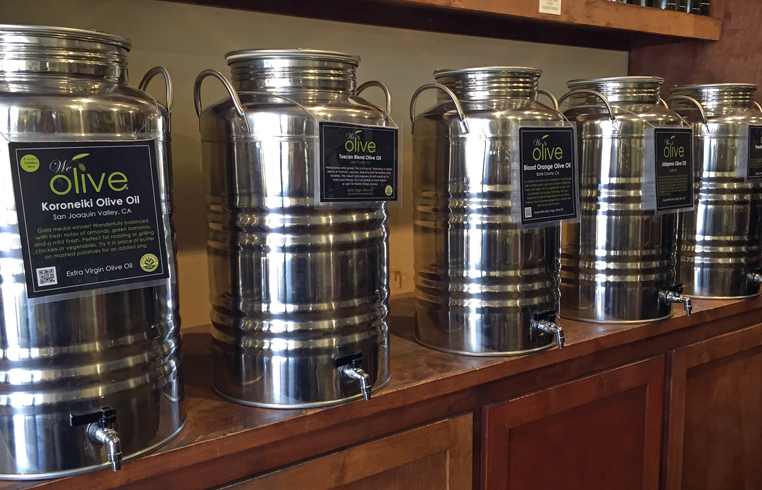 If you’ve been thinking about canning, but felt uncertain or afraid, don’t let that hold you back! It’s easier and less scary than you might think! Just take the time to learn a little about the process of canning and why it’s important to follow recipes and canning steps as written. Here are some resources that I’ve found informative and helpful. 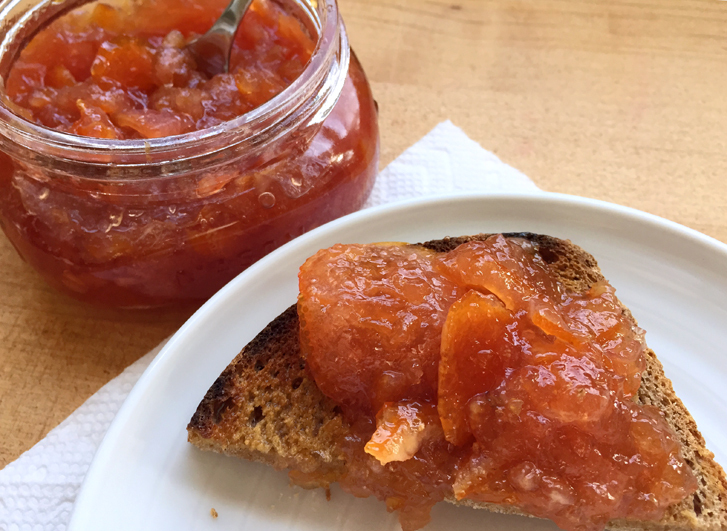 Easy citrus marmalade: If you’re just starting out, this Blood-Orange Rosemary Marmalade from The Herbfarm Cookbook is an easy introduction to canning. Prep work is minimal, and there’s no water bath processing step to worry about (you will have to sterilize the jars and lids, though). I’ve substituted regular oranges and ruby grapefruits with success. 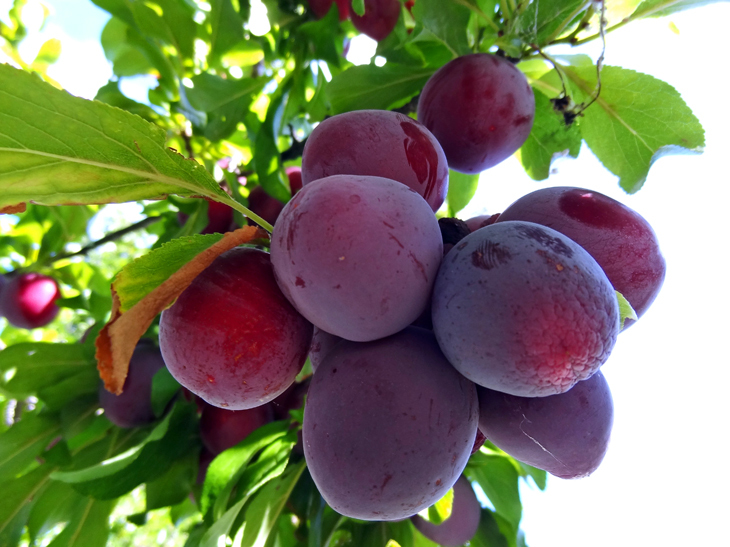 Pectin-free, low-sugar fruit jams: While searching for small-batch, pectin-free, low-sugar recipes, I stumbled upon this post on Northwest Edible Life. Blogger Erica not only provides a detailed introduction to making jam the old-school way, but also offers up this fun chart for creating your own custom flavors. And let’s not forget the simplest way to reduce food waste: share with family, neighbors, and friends. Every summer I trade apricots to my next-door neighbors for their home-grown tomatoes. They make apricot pie, and I make a batch of oven-dried tomatoes (some of which eventually make it into the freezer for longer preservation!). 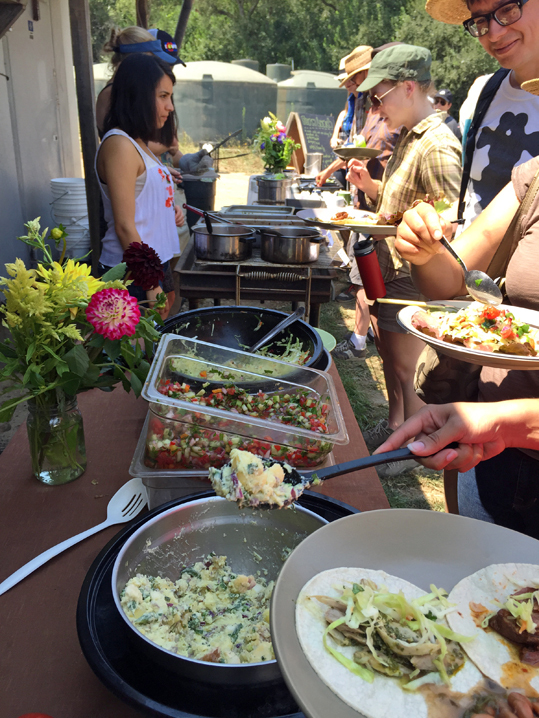 Want a broader community for sharing your abundance of home-grown fruits and vegetables? Try offering it on neighborhood websites Freecycle.org or Nextdoor.com. How are you preventing summer food waste at home? Share your ideas and thoughts in the comments below or on our Facebook page. You are currently browsing the Eat Local category at 650Food.